The island invites visitors to undertake a sensory journey of discovery through natural surroundings and architecture. The contemporary park formed by the restored plain of the river Erft symbolises the idea of an artistic cultural landscape through its dialogue between nature, art and architecture. Experiencing “art parallel to nature” – a free borrowing from a quote by Paul Cézanne – opens up many paths and interrelations. Landscape designer Bernhard Korte combined different parts of the extensive terrain to form an area with parkland, a river plain and terraced ground. Paved and unpaved paths and tracks run through the tranquil landscape while bridges and walkways cross areas of water and swampy ground. The sculptor Erwin Heerich created 11 pavilions, each of which – art in itself – is home to other works of art. When designing the pavilions, Heerich adhered to the concepts of plainness and simplicity but simultaneously adapted his buildings to the landscape of the Lower Rhine plain in an ideal and harmonious manner. The buildings blend into the landscape harmoniously as walk-in sculptures. The sun’s position and the seasons provide a charming, varying play of light between nature and architecture. “Rosa Haus”, a villa dating from the 19th century, and its strict axial garden of 1820 can be regarded as the origin of the present-day park. Magnificent copper beeches, a court oak and a giant southern cypress date back to the park’s beginnings. Visitors to the Museum Insel Hombroich have to decide for themselves whether they wish to give priority to the buildings and the works of art housed there or to the natural environment with its changes throughout the course of the seasons. stützt, dient und lässt frei. Sie ist kein Muss, sondern ein Darf. sondern sowohl – als auch. Sie vertraut dem, der ernsthaft ist. Die Insel hat kaum Platz für Männlichkeit. The Museumsinsel Hombroích is a renaturalised area of river plain designed as a contemporary park. Its dialogue between nature, art and culture makes it an exemplary representation of the concept of an artistic cultural landscape. Paul Cézanne’s concept of “art parallel to nature” seems to have been made for the island. What is now the Museumsinsel Hombroich was an elemental park landscape in the 17th century. The island’s woods, meadows and stretches of water made it a varied natural landscape in the midst of the old farmland and arable land on the Erft floodplains between Neuss and Grevenbroich. The valley has been the site of human habitation for thousands of years. Evidence of this can clearly be seen in the Stone-Age artefacts, Roman ruins and the remains of mediaeval earth mounds, or “mottes”, which were once heaped up by the population as dwellings so as to avoid the swamps. A geometrical park was laid out on this terrain for the first time in 1820, when the Hombroich family, an industrial family from Wuppertal, acquired a country residence here. The layout of the old park reflects a strict, axial design, whereby some of the axes are also found far outside the area as agricultural roads in the structured landscape. Numerous trees around the manor house, known as the “Rosa Haus”, have now grown into splendid specimens, among them wonderful copper beeches, a court oak and a 35-metre southern bald cypress with a girth of up to five metres. In 1984, the Düsseldorf art collector Karl-Heinrich Müller acquired the romantic, overgrown park and its 1816 villa, i.e. the island, with the intention of presenting his art collection to the public here and thus realising his life vision. From 1984 to 1986, the landscape designer Bernhard Korte combined different parts of the extensive Erft river terrain to create an area consisting of parkland, river plain and terraced ground. Paved and unpaved paths and tracks run through the tranquil landscape while bridges and walkways cross extensive stretches of water, swampy ground and wetlands. In summer, the landscape flowers profusely, while in winter its mists often give it a melancholy air. The island is characterised by constant change and transformation. Plants can proliferate here. Meadows of wild flowers and roses claim their place alongside birches, poplars, osiers, hornbeams, elders, hawthorns and reeds. Marsh marigolds, sedges, Alisma, irises, meadowsweet, common gypsywort, water crow-foot and bur-reeds can be found among the profuse vegetation which once gave rise to the lignite found in this area. 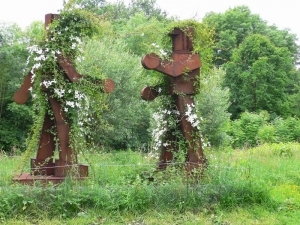 The artist Anatol Herzfeld used his own works to create a sculpture garden – an artist’s garden in the park – around an outbuilding which had been converted into a studio in the style of a Masurian farmhouse (dacha) in 1982. Anatol created several cycles of work in ring formations around his workshop, resulting in a garden of rings which is both meditative and mystical. Next to the long gallery with stone sculptures by Erwin Heerich, a bridge across the Erft river links the contemporary garden with the historical landscape around the “Rosa Haus”. A prolific and lush paradise with contemporary art can be found here. 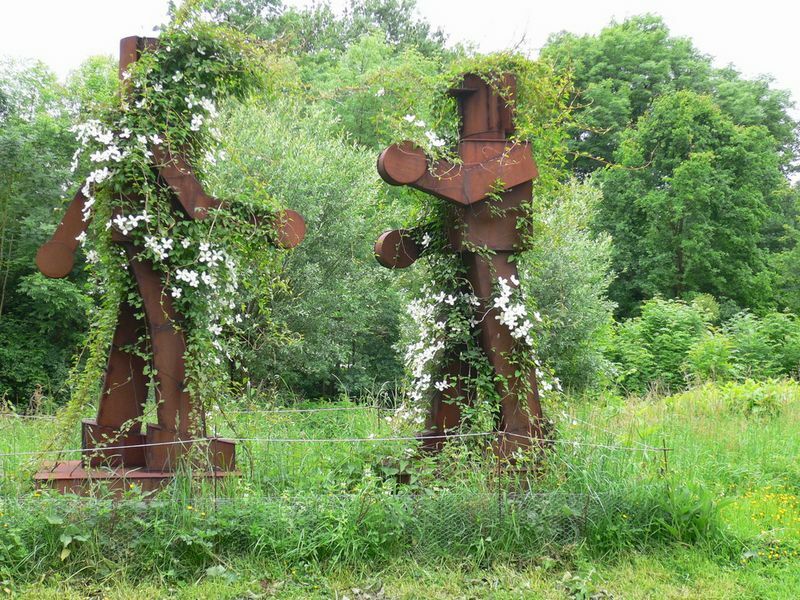 Various sculptures stand or lie hidden in the grass – in the woods and glades or between the rhododendrons, hydrangeas, white wisteria, yellow water irises and ancient yew hedges. The circular glass Graubner pavilion with its unique acoustics guides the visitor’s gaze across the overgrown formal garden with its former strict structures. Above the idyllic pond in the woods, an old white tea house provides a shady spot on hot days. It can be reached by a flight of stone steps. Between the unruly yew hedges is a hidden pool covered with profusely flowering wisteria and flanked by a stone Indian deity. It is an idyllic, meditative spot. The sculptor and architect Erwin Heerich created 11 pavilions on the island, each of which – art in itself – is home to other works of art. When designing the pavilions, Heerich adhered to the concepts of plainness and simplicity but simultaneously adapted his buildings to the landscape of the Lower Rhine plain in an ideal and harmonious manner. The buildings blend into the landscape harmoniously as walk-in sculptures. The sun’s position and the seasons provide a charming, varying play of light between nature and architecture. Each building is also a resonating chamber for impressive acoustic experiences so that musicians and sound artists are repeatedly inspired to try out musical experiments. The outside walls of the rooms are faced with rough, broken bricks while the inside surfaces are plastered in pure white. The rooms enter into a dialogue with nature and the park through the large windows and mostly open doors. There are works by Cézanne, Klimt, Arp, Graubner, Fautrier, Calder, Matisse, Tadeusz, Giacometti, Schwitters and Picabia on display in the pavilions alongside old Khmer art and Persian and Chinese sculptures. The Hombroich principle has a very simple philosophy. Its starting point is the visitor’s individual perception through which impressions should be gained without any guiding didactics. The “island” prescribes very little – neither paths nor ways of seeing. The only prerequisite is the enjoyment of beauty and a desire to explore. The café, built in the style of an orangery with large areas of glass, is the island’s communicative centre and provides both sunny and shady spots on its terrace. Visitors are drawn here as if by magic after they have explored the island. The simple regional cuisine is included in the entrance fee. A foundation to support Insel Hombroich has been in place since 2000. The foundation’s activities include open workshop days for willing volunteers who are interested in “working” the park and garden together. The neighbouring missile station has belonged to Museum Insel Hombroich since 1995. It provides living quarters and workrooms for artists, writers, musicians and scientists. The latest project is “Hombroich Spaceplacelab” , the aim of which is to establish a new form of urban landscape in collaboration with well-known architects such as Raimund Abraham, Tadao Ando. Daniel Libeskind, Frei Otto and Alvaro Siza. The long-term objective is to transform the intensively farmed countryside directly on Neuss’ doorstep into a semi-natural landscape with extensive farming and special architectural forms. Rümler, Roland (2003): Die Museumsinsel Hombroich. In: Landschaftsverband Rheinland, Hrsg. : Gartenkultur im Rheinland. Arbeitsheft der rheinischen Denkmalpflege 60. S. 294 ff. Petersberg. Simon, Axel (2006): Insel Hombroich – die Geschichte. tec21, 36/2005. Wang, Wilfried (2004): Kulturraum Hombroich. 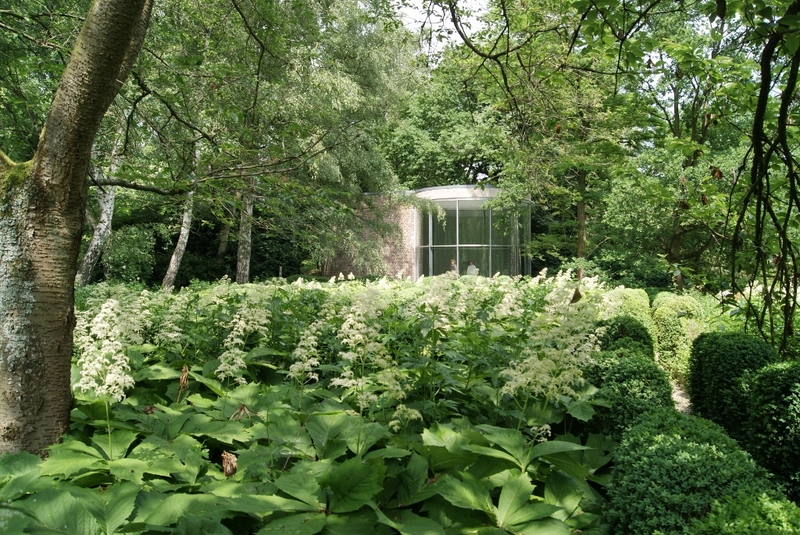 von Behr, Karin; Nickig, Marion (2005): Insel Hombroich: Der Garten der Ringe. In: Künstlergärten in Deutschland. Ellert + Richter Verlag. April to September 10 a.m. until 7 p.m.
October to March 10 a.m. until 5 p.m. The café closes one hour earlier than the museum. No reductions for groups. Groups are asked to make reservations by museum@inselhombroich.de. Accessibility – in the park/ garden from the car park: : The main paths are suitable for visitors with limited mobility There is also a level entrance. Visitors receive a description of how to get to this entrance (3-5 mins. by car) when they buy an entrance ticket at the museum ticket office. The Landschaftsschutzbehörde (Landscape Conservation Office) has stipulated that visitors must not leave the marked gravel paths. Picnics on the grass with blankets and the visitors’ own food are therefore not permitted. Visitors are requested to respect this rule. General map and further information on the park are available at the entrance.